The full-court press is on from every organ of enlightened liberal opinion: the Supreme Court must not decide this term’s big Obamacare case, King v. Burwell, on the actual legal merits, which are a slam-dunk for the plaintiffs. Instead, supporters of the government want the case decided on the consequences of the Court stopping the flow of illegal subsidies. And they want to ignore the fact that stopping the subsidies will actually free millions of people in opt-out states from the individual and employer mandates. They only want to talk about people who would lose subsidies. Upping the ante, the Obama administration is aggressively marketing subsidized plans without a word of warning that the subsidies may be struck down as illegal – and that recipients may be required to pay them back. Taxpayer-funded TV ads in heavy rotation say “most are eligible for financial assistance,” even though that’s probably not true. Why? To create as many victims as possible. Hostages who will be used to bully the Supreme Court. The over-the-top intimidation campaign comes from a place of profound weakness. The section of Obamacare that defines eligibility for subsidies says they are available only through an “exchange established by the state.” The language is expressly used twice and is incorporated by cross-reference seven additional times. No other language is ever used to describe subsidy eligibility. An early draft of the IRS rule included the phrase, but the language was, without explanation, scrapped in favor of a rule that asserts that subsidies are available through all exchanges. 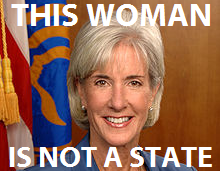 Healthcare.gov was established by Kathleen Sebelius when she was the federal Secretary of Health and Human Services. She is a very accomplished person, but she is not a state. So out go real legal arguments, and in comes a lot of hand-waving to create a slender enough legal pretext to engage the real liberal strategy of fear and intimidation. The justices are, without much subtlety, being told it will be their fault if millions of victims lose subsidies, even though those subsidies have always been illegal. Don’t blame the IRS, they say, for a rule at war with the underlying statute. Don’t blame the Obama administration for aggressively signing people up for subsidies they know are illegal. It’s all quite shameful, and of course most of the media is happily along for the ride. But if we’re looking at consequences, we can’t overlook the millions of people who stand to benefit from a decision upholding the law’s limitation of subsidies to state-established exchanges. Indeed, the plaintiffs in King and related cases are businesses, individuals, and states that sued precisely because the administration’s on-the-fly, illegal rewrite of the law hurts them. The employer mandate only applies to businesses with subsidy-eligible employees, which is one of the reasons so many states said no to subsidies. They wanted to protect their citizens from lost jobs and shift cuts to get under the employer mandate’s notorious 30-hour requirement. A victory for the plaintiffs would free approximately 57 million employees of 250,000 employers from the employer mandate. Not all of the employers who stand to gain are businesses, either. State and local governments, school districts, fire departments, and libraries are being hammered by the employer mandate. This is why Indiana has its own lawsuit on the issue. The individual mandate also largely applies only where subsidies are available, because Obamacare plans are so expensive that, without subsidies, almost everyone qualifies for an exemption. The IRS alleges that six million people owe individual mandate penalty taxes this year; they refuse to say how many of those would not owe tax if the Court rules for the plaintiffs, but it would almost certainly be more than half – that’s three million people protected from illegal taxes. And for those who do lose those illegal subsidies, Congress will almost certainly act. Not to legalize the subsidies, but to give states regulatory relief and flexibility – and likely funding – to help people get out of one-size-fits-all Obamacare and into affordable plans that meet their specific needs. In fact, given how Obamacare’s problems become more glaring by the day, they could end up being the biggest winners of all.